John Isaiah Pepion (Piikani) is an artist from the Blackfeet Nation in northern Montana. He holds degrees in art marketing and museum studies from United Tribes Technical College and the Institute of American Indian Arts. He speaks with troubled youth in public schools to promote the benefits of art as therapy. John is among the first Indigenous artists to hang in the Wyoming State Museum. That exhibit — “We Were. We Are.” — features the work of six artists from the Northern Arapaho Artists Society and the Creative Indigenous Collective. John was one of the founders of the latter. John recently had a piece acquired for the Library of Congress’s permanent collection. He is a 2017 First Peoples Fund Artists in Business Leadership fellow. Going to ceremony, John sits and watches the movements, the designs. Ideas turn over in his mind, coming up with the images he will use in his art. There’s always a story behind every piece he creates. The designs and colors mean something. 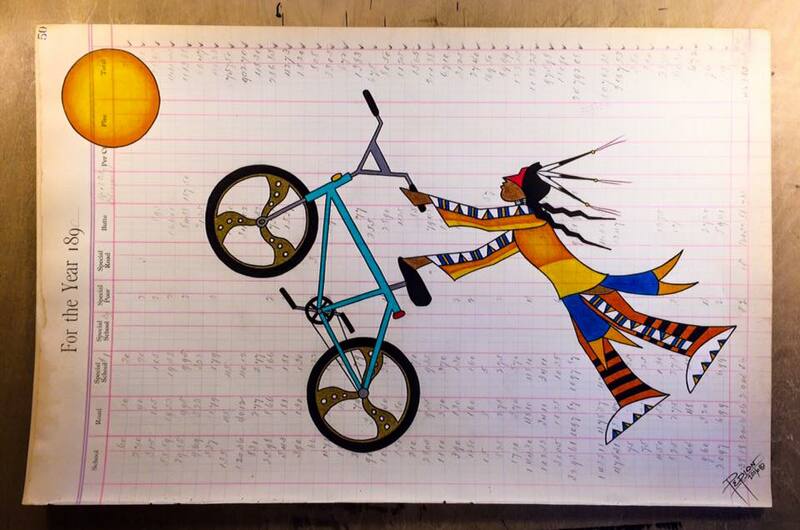 In this piece the Native character, dressed in traditional regalia, does the Superman trick on his bike. It represents two worlds: the Indian world and the new world with computers, bikes, cell phones. With skill and a little humor, John bridges that gap, bringing two worlds together.